The Hotel Alcott is a masterfully restored Italianate-bracketed villa located steps from the Atlantic Ocean and Cape May’s award winning beach in Victorian Cape May, NJ. Here old meets new on a majestic scale. Surrounded by the antiques and ambiance of a time gone by, but offering all the amenities of a full-service, modern hotel, the Hotel Alcott’s thirty-one custom furnished guest rooms and suites provide the best of both worlds. 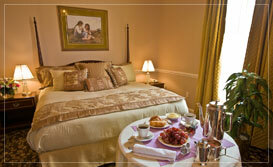 Come experience the modern comfort and bygone elegance of Cape May’s Hotel Alcott. All of our guest rooms have a unique size or shape and varying architectural features - but each has everything you need to relax, unwind and renew after a long day of exploring all that Cape May has to offer. BOOK NOW AND TAKE ADVANTAGE OF OUR EARLY BIRD PROMOTION OFFERS! May not be combined with any other discounted rates, and are subject to expiration without notice. Each of our 31 guest rooms has everything you need to relax, unwind and renew after a long day of exploring all that Cape May has to offer. Darling of the critics. Favorite of those in the know. Cape May's best kept secret is out. 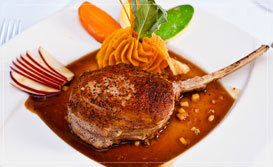 Come sample some of the most mouthwatering cuisine Cape May has to offer. The Hotel Alcott has been completely restored and is ready to accommodate everything from the most intimate to the most lavish affair. 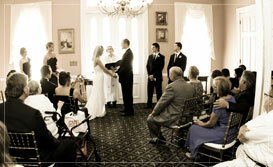 Our staff is totally committed to working with you to design a day that you’ll treasure.